Yosemite and Sequoia National Parks are Amazing!! If you look at our route on the map you'll notice that Freso is a little off our beaten trail. 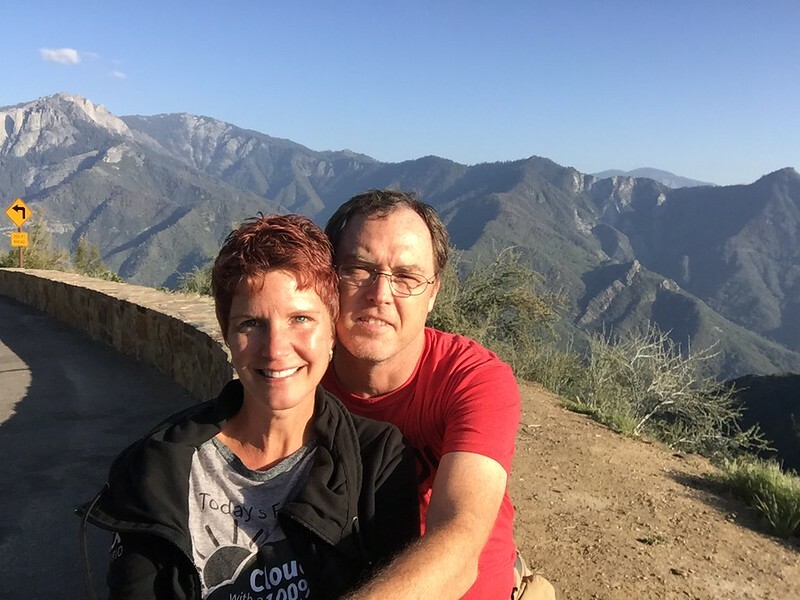 We discussed skipping Fresno and pushing on to San Francisco but I lobbied hard for the stop as I really wanted to visit Yosemite and Sequoia National Parks. Cathy's plan was to visit them next summer since it was a couple of hours out of our way but I finally I won her over by groveling. The words "amazing" and "awesome" are used throughout this blog post but are quite applicable. I apologize for not being more expressive but I'm a simple man with simple words. The journey from San Luis Obispo was somewhat stressful. After being on the road for a few minutes we realized that we only had a half talk of gas and an extremely low tire on the right side of the RV. To make matters worse the GPS took us on a terrible route an hour or so through the mountains on a super windy, narrow road. We were afraid we'd either run out of gas or flip the RV. It was so rural that we probably saw less than 20 cars during that portion of the route. We finally hit the major highway (the one we should have been on) and found a gas station to fill up and put some air in our tire. The remainder of the trip was uneventful as there's virtually nothing between SLO and Fresno; just farmland. Fortunately the RV spot was easy to pull into and after setting up, we headed into Fresno to run some errands and eat dinner at Sequoia Brewery. We sat out back on the patio in the setting sun with good food and good beer! 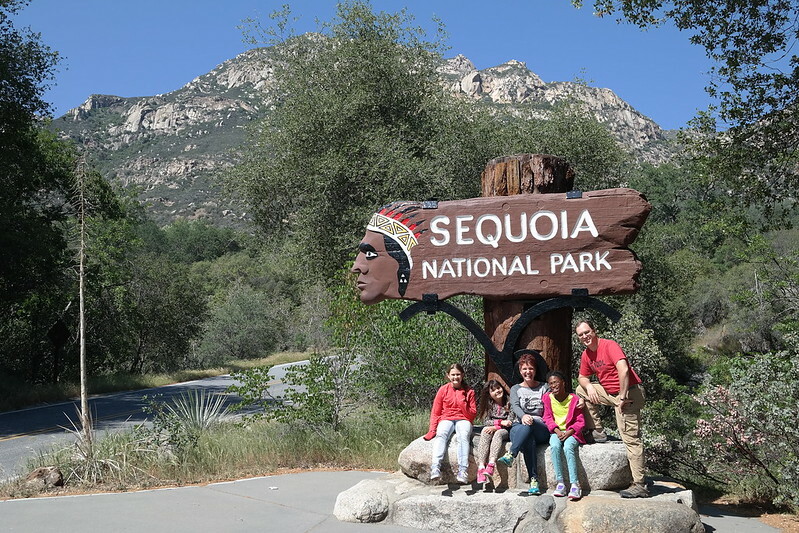 After work on Thursday we took the short drive to Sequoia National Park. It was abolutely gorgeous so don't skip the pictures below. In retrospect I enjoyed Sequoia more that Yosemite. The trees are absolutely amazing and I think I've been converted to a "tree hugger". I found it fascinating that these giant trees have been growing for centuries only on one side of the Sierra Nevada mountain. We drove through a stretch of the forest that was on fire (on purpose) so it was a good teaching moment to describe how fire is actually beneficial to the growth of these trees. 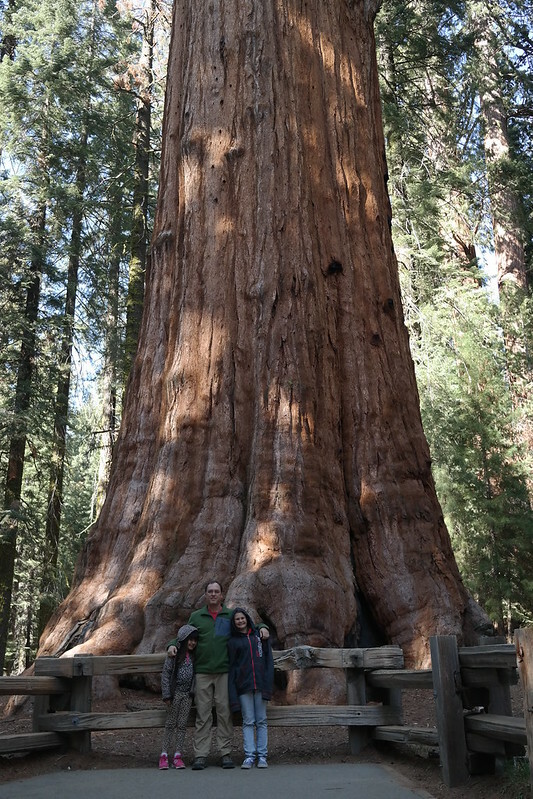 Our first stop was The General Sherman Tree. It was also probably 30 degrees colder in the groves than when we entered the park so it was a nice walk. There's no doubt why it's the "General"; it's massive and words don't do it justice. We walked through the trees for an hour or so taking a bunch of pictures and just soaking in the forest. They've done a great job building a tourist path to the trees without disturbing the forest so it's a nice little hike. 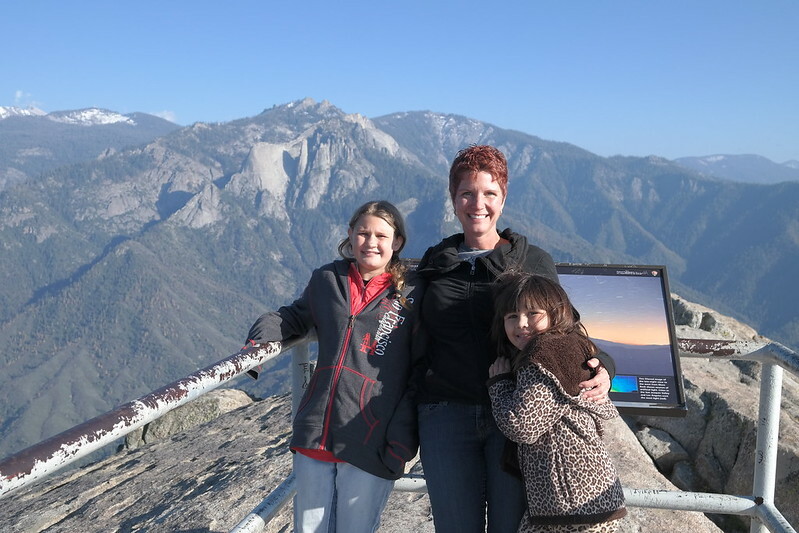 Our next stop on the way back out of the park was at Moro Rock which has an amazing view of the park. I think it's the highest point in the park? The path and steps to the top are steep and narrow and Kira wanted no part of it. We had to take a couple of breaks for her. We encouraged her to keep going but she refused to go to the very top so I ended up staying with her while everyone else continued on. The girls loved the view from the top and said it was "amazing". Check out the videos below. Afterwards we made our way out of the park (stopping along the way for too many selfies) and found a small restaurant on the river for a late dinner. Dinner wasn't fantastic but the view was. We entertained the girls by asking them a series of ethical questions. 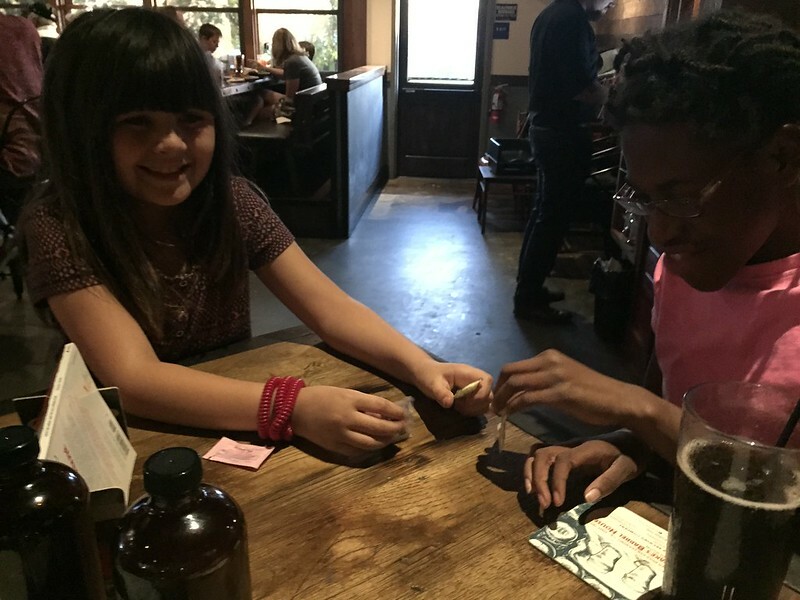 There was a 13 year old boy bussing tables and delivering food who kept stopping by to see if we needed anything. I gave him a hard time and asked what his intentions were with my daughter. After school on Friday Cathy colored Easter eggs with the girls and we took off for dinner in Fresno. We headed to the north side of town where all of the new develoment is located (it's quite nice!) and had an awesome dinner at Westwoods Barbecue and Spice Company. The little girls didn't bring any dolls/toys to play with so they improvised with sugar packets and salt shakers. The food was great and our waiter was really nice, even though he was Canadian. We talked about our trip and being foster parents and he told another table of our conversation (I think they were friends?) and they bought us a round of drinks. We complimented the manager on his restaurant and he gave the girls a free bag of ginormous cookies. Great night!! We ran a few quick errands and then headed home for bed. 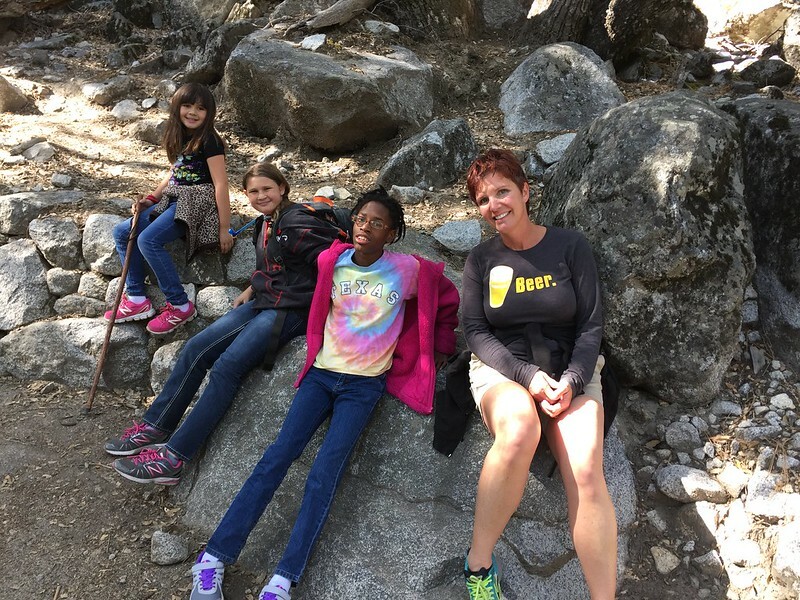 We were spendingh the weekend in Yosemite so I needed my beauty sleep. Saturday morning we took off around 9am for Yosemite with the intentions of spending the night and doing Yosemite again on Sunday, if we could find a hotel. If not we'd just drive home. The 3+ hour drive wasn't bad until we were a mile from the park gates and then it slowed to a crawl. 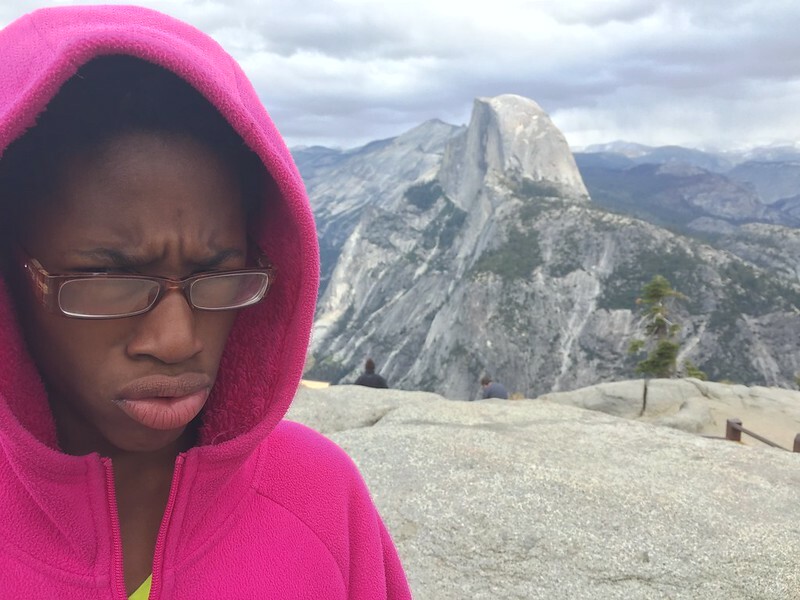 We found out that Yosemite is extremely crowded with visitors... to the point that it's almost not worth the trip. We stopped at the Wawona Hotel to see if they have any vacancies (they didn't) and grab some lunch in the restaurnt. Afterwards we immediately headed towards the village marveling at the awesome scenery. It was a beautiful, sunny day and we immediatly came to the realization that everyone had the same idea as us... "let's go to Yosemite!" We drove around for about 30 minutes looking for a place to park before we made our own spot on the side of the road next to one of the campgrounds. 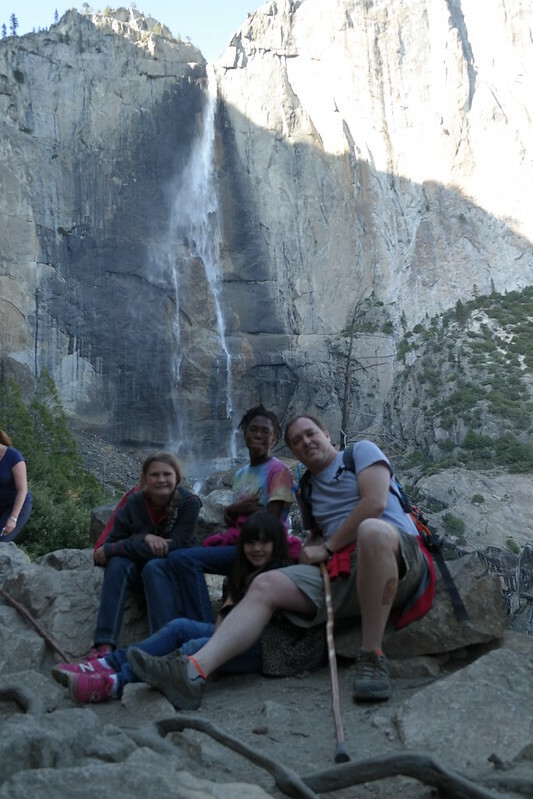 We filled up our camelbacks and headed on a hike up the mountain to see the Upper Yosemite Falls. The path wound its way up the mountain and was uneven and rocky. Much harder than we anticipated. Kira did well but after 90 minutes we decided to take a few pictures at the scenic pass for the falls (it was actually super nice!) and head back down instead of climbing another hour or two to the top. The path was crowded with people going both ways and we saw some crazy things. We passed a lady descending the mountain with a 2yr old on her shoulders. Definitely not a way to carry your kid down the side of a mountain. Cathy almost grabbed the baby and carried it herself. Everyone was exhausted when we made it to the bottom so we made the hour drive out of the park to try and find a hotel. It was about 7pm when we hit civilation and found an (overpriced) hotel with rooms available. After getting checked in we found the South Gate Brewing Company and grabbed some food while watched UK lose in the final four. The next morning everyone woke up late and took their time getting ready for our day in the park. I left to get McDonald's for breakfast, subs for lunch and more water for the camelbacks. We beat the traffic to the park and headed back to the village. It was Easter Sunday and there were far fewer people at the park, even in the afternoon. We'd read about a hike with a paved path around Mirror Lake so we decided to give that a try. It turned out to be a pretty steep climb at certain points and Kira wasn't having fun at all. After 45 minutes I made an executive decision and asked Cathy if we could turn around. We finally got back to the truck and decided it was time for a picnic. Our next stop was the awesome Tunnel View, probably my favorite part of the park. We walked around and took pictures and finally hopped back in the truck for lunch. It was a little too windy for Cathy so I parked the truck facing Yosemite Valley, El Capitan, Bridalveil Falls, and Half Dome; and we ate our subs while staring at some of the best scenery in the world. Our next and last stop was Glacier Point for a spectactular view of Half Dome. It was an hour or so drive and 3000+ feet higher than the Valley floor. It was cold, probably in the high 30's, and we weren't prepared; I was still wearing shorts. Kira wasn't happy at all. We ducked into the gift shop to pick up some trinkets while trying to stay warm. We took one more quick peek and, literally, ran back to the truck and drove the three hours home. Monday and Tuesday were typical days and we slowly recovered from the weekend. School and work and then out for dinner each night. Monday we found a nice little brewery (Brewbakers) in Vasalia and then we wandered into the Fresno Tap House Grill Tuesday night. It just happened to be National Beer Day and with 130+ beers on tap I celebrated accordingly.